With the success of all of the toys-to-life games that have sprung up in the market lately, it was only a matter of time before the folks at Lego got in on the action. Lego is one of the most enduring toys on the market today, they have a proven track record in the video game space thanks to developer TT Games, and Lego series publisher WB Games has a huge catalog of popular IP’s in which to pull from as well as a lot of great relationships with other property holders. 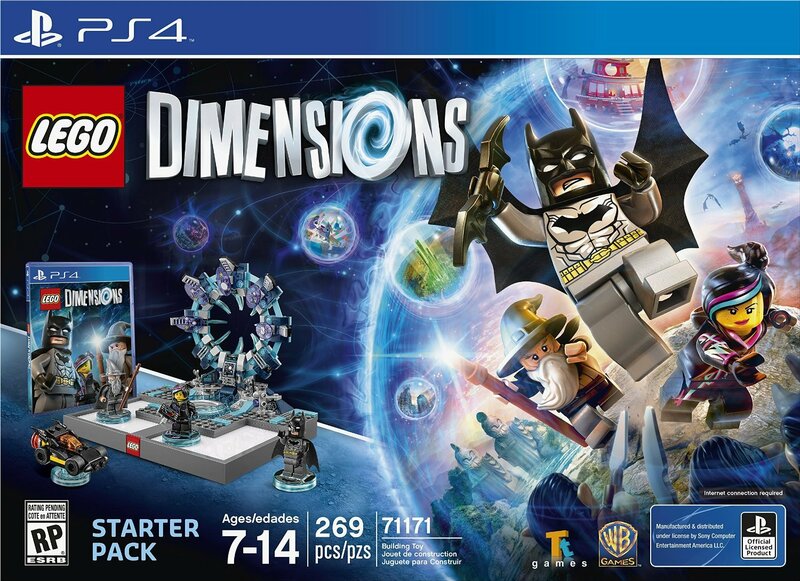 Though Lego Dimensions is last to market and comes with a pretty hefty price tag, it is perhaps the best example of toys-to-life that encourages players to interact with the real world more so than any of the competition on the market that is great game not only for the young, but the young at heart. When the evil Lord Vortech starts invading dimensions and causing chaos in the Lego multiverse, it’s up to an unlikely alliance of Batman, Gandalf from the Lord of the Rings and Wildstyle from The Lego Movie to bring order and save their friends who have also been captured by Vortech. In reading that sentence, you’d probably think that Lego Dimensions has an absurd premise, and believe me, it does, but it also works really, really well. It does its job of bringing the characters found in the starter pack together and putting them on a journey that has them visiting worlds from the likes of Doctor Who, Back to the Future, Ghostbusters and The Simpsons that should never be in the same game, let alone make sense. Yet, it all does. This is due in large part to the fantastic writing and performances behind Lego Dimensions. From the opening stage that has the trio venture to the world of The Wizard of Oz, you’re already smiling from ear-to-ear and want to keep playing to find out where this game is going to take you and what’s around the corner. Some of the stages do work better than others: A property I didn’t think would fit, Valve’s Portal franchise, turns out to be one of the strongest levels; While others I couldn’t wait to visit, like Back to the Future, turn out to be missed opportunities that don’t take advantage of the IP like you would hope. Though some levels are disappointing, none are ever flat-out bad, and even when you come across one that you might not enjoy, there’s probably another one waiting for you around the corner to get you right back into the experience. When it came to the vocal performances, the folks at WB Games certainly spared no expense, and I’m not saying that because Jurassic World characters are in the game. Dimensions mixes in professional voice actors like Troy Baker; actors reprising their roles like Elizabeth Banks as Wildstyle from The Lego Movie, Peter Capaldi as the 12th Doctor from Doctor Who, even Micheal J. Fox and Christopher Lloyd returning as Marty and Doc Brown from Back to the Future, along with archived voice clips from films like Ghostbusters. The villain created for the game, Lord Voretch, is voiced by Gary Oldman and he turns in a performance that straddles the line perfectly between being cartoonishly evil and hilarious. Having the actors like Oldman, Fox, Lloyd and Capaldi beings an authenticity to each world that helps sell the crazy mash-up that features among other things Two-Face from Batman riding an elephant from the Lord of the Rings that’s equipped with a mini-gun. It doesn’t hurt that all the actors on hand all appear to be having a ton of fun playing with the absurdity of the game that they’re in, as even one person phoning in their performance would hurt the shaky foundation a lot. Before you even start to play the game, you have to assemble all the things that come in the Lego Dimensions starter pack. 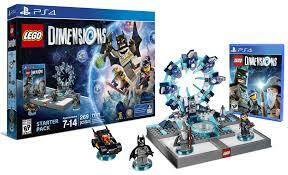 Included with the game are mini-figs for Batman, Gandalf and Wildstyle, along with the Batmobile and the Lego portal that attaches to the base that links the game to the console. Technically speaking you don’t have to assemble any these things, but come on, when is it never not fun to assemble anything Lego? 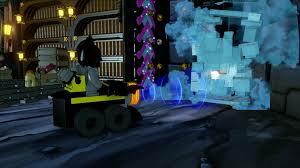 Having the fully put together portal with your vehicles and mini-figs in plain sight also is Lego Dimensions greatest strength in the toys-to-life genre in that it’s something that bridges the two like never before. Normally in any given Lego game you have a huge roster of characters to play as, each with their own unique skills and abilities that can be combined to solve puzzles or hunt down secrets. In Lego Dimensions, you only have three characters and a vehicle which is all you need to play through the entire ten-to-fifteen hour as well as get all the game’s trophies and achievements. To compensate for the lack of characters and to keep the game from ever getting stale, the developers turned to one of the most under utilized assets of the toys-to-life category: the base. In games like Skylanders and Disney Infinity, the base is used to bring the physical character into the game, and it serves a similar function in Lego Dimensions, but there’s also much more to it than that. A combination of up to seven characters, vehicles and accessories can be placed on the base to be used at any given time, however the base also gains new abilities as you progress through the game. Portals will open for example that correspond to a colour that lights up on the base. Placing a character on that part of the base will send them through a portal in the game to reach an otherwise inaccessable area. Placing characters on certain parts will also grant temporary elemental abilities like shields for passing through electric and water traps or the power to grow trees and burn things down. Other times you can shrink or grow characters by placing them on one side where you use one character who’s small to get through a maze while another giant character assists by filling in gaps with otherwise unliftable blocks. There’s a few more abilities that you’ll also unlock that are equally as fun to use, and all are rolled out at a great pace. Dimensions doesn’t overwhelm you with all of the abilities at once, but rather introduces them one at a time before asking players to combine them to solve some really clever puzzles.This interaction with the portal gives the first real sense of playing with a toy while at the same time playing a game, unlike competitor products that just ask you to passively place a figure on a base and be done with it. Outside of the new gameplay opportunities opened by the portal, those who played any other Lego game will feel at home here, destroying scenery to collect studs and to build objects to solve environmental puzzlese. An interesting new addition to the formula allows you to level up vehicles which not only allows them to power up their existing abilities, but to change form both in-game and in the real world via on-screen instructions. The Batmobile can reconfigure itself for example into a vehicle that can tow things and shatter glass with a sonic cannon whereas initially its function is power up speed ramps. 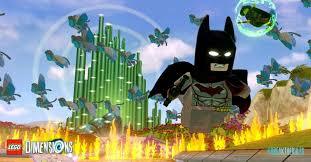 On top of the story campaign, there’s also three adventure worlds to play around it that are small open-world areas like those found in other Lego titles such as Lego Marvel Super Heroes or the latter two Lego Batman games. These are all set in the worlds of the three characters found in the starter park where you can hunt for things like red and gold Lego bricks, compete in races or complete quests given by non-playable characters. This section isn’t quite as entertaining as going through the main campaign as you’re limited to three areas that you’ll spend quite a bit of time in, but it does add a lot of replay value once you’ve gone through the story, as tracking down mini-kits in freeplay mode is a lot more costly this time around. You only need what’s in the starter pack to play the game, but if you’re a perfectionist, you’re going to have to open up your wallet. There’s plenty of times in the campaign where you can see something that your characters can’t interact with and the game informs you what characters or vehicles you need in order to get through. Extra characters come in one of three categories: Fun Packs that have an additional character and a vehicle; Team-up packs that come with two characters and vehicles and Level packs that give you a character, a vehicle, an accessory, as well as a new stage and adventure level. If you get into Lego Dimensions you’ll want to add to your collection to build up your abilities or to get new areas to explore, but the game also gives you the option to rent characters at the cost of the studs you’ve collected within a level should you not want to own that character or simply can’t afford them. A cynic can look at what TT Games and Lego created as a means to sell more toys and cash in on the huge number of properties they’ve assembled, but that would be doing a disservice to what the folks at TT Games have accomplished with Lego Dimensions. Yes, the folks who put this together want you to buy lots and lots of plastic toys, but they also understand that no one would want to do that if the game that asked you to do so wasn’t something truly special. Dimensions is an odd mash-up of movie, TV and video game properties that somehow manages to be a celebration of everything assembled within the game. Combined with the creative use of the base that asks the player to interact with their toys just as much as the game, and you’ve got a title that while costly, is well worth the asking price.